Features ! 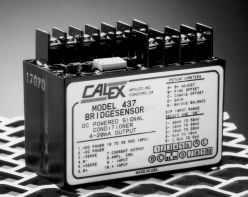 Complete Strain Gage Bridge Signal Conditioner ! 4-20 mA or 0-20 mA Output ! Output Capable of Driving 1000 ohm Loop ! Bridge Balance with 68% Tare Offset Capability ! High Gain Amplifier; Can Accept Live Load Signals as Low as 3 mV and Provide 16 mA Output Span ! Sufficient Excitation Current for Five Load Cells ! Powered by 10 to 36 VDC Unregulated ! Rugged Epoxy Encapsulated Design.